A solemn evening dedicated to the 70th anniversary of an outstanding pianist, composer, rector of the Baku Musical Academy Farhad Badalbayli has been held in Azerbaijan State Philharmonic Hall. Prominent public figures, famous representatives of science, literature, culture, art, as well as friends and numerous admirers of Badalbayli's creative work came to congratulate the hero of the day. The evening was opened by the concerto for piano and orchestra (three parts) of the American composer George Gershwin. The composition was performed by Farhad Badalbayli and the State Symphony Orchestra named after Uzeyir Hajibeyli, conducted by People's Artist of Azerbaijan Yalchin Adigezalov. Farhad Badalbayli literally bewitched the audience, who listened to the composition with bated breath. The audience then gave him a round of applause. "Throughout our lives, we are losing family, close people, loyal and reliable friends. Today, together with my colleagues, we want to perform the work of Pietro Mascagni for you, and remember those who are not with us," the musician said. For many of those present, it was a surprise that the People's Artist did not sit at the piano, but stood behind the conductor's path. The music piece "Autumn Flowers" from the opera "Rural Honor" was performed by the State Symphony, conducted by Badalbayli. Further, well-known pianists, pro-rector of the Baku Musical Academy on international issues, People's Artist YeganaAkhundova and director of the International Mugham Center, People's Artist of Azerbaijan Murad Huseynov appeared on the stage. They performed concert for two pianos and orchestra of the French composer Francis Poulenc. Pianists conquered the audience with their virtuosic play. Then Badalbayli and director of the State Philharmonic Society, People's Artist of Azerbaijan Murad Adigozalzade were invited to the stage. 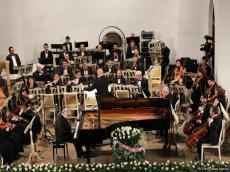 Pianists, accompanied by musicians of the orchestra conducted by Honored Artist Fuad Ibrahimov, sang Suite No.2 for two pianos Sergei Rachmaninov. Pianists-virtuosos have a huge energy and charisma, and of course, they conquered the audience. The listeners thanked the musicians with an endless ovation. At the end of the evening, all the participants of the concert program were invited to the stage. Farhad Badalbayli performed a musical composition with Murad Huseynov, and then with Adigozalzade. Fascinating music, excellent performing skills of soloists and musicians of the orchestra, excellent work of conductors made this evening unforgettable. Notably, President Ilham Aliyev presented "Istiglal" Order to people's artist, outstanding pianist Farhad Badalbayli on December 25.